Finally, we did it! 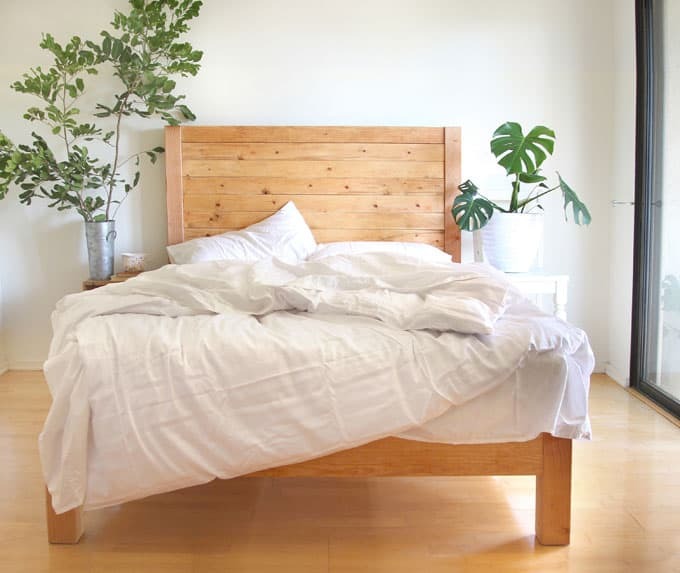 This DIY platform bed frame is inspired by some of the $1000 – $2000+ beautiful wood bed frames we love. SO, what does it take? One weekend, $100, and a few simple tools most beginning DIY enthusiasts have! Part 1: Planning. How to select lumber for strength, work-ability and beauty – SUPER important! Part 2: Step by step tutorial on how to build a wood bed frame that can be easily disassembled when moving. Part 3: How to adapt this DIY bed frame plan to any size bed, such as a king bed, a twin bed, with or without headboard, etc. Part 4: Best natural finishes for your wood bed frame and headboard. Update: our reader Eliese left a comment sharing their experience and some great tips, you can check it out in the comment section at the end. Thank you Eliese! ( Some of the helpful resources are affiliate links. Full disclosure here. ) Last summer, prompted by a move, and inspired by this amazing book: The Life-changing Magic of Tidying Up, we decided to embark on an epic decluttering of everything, and only surrounding ourselves with things that spark joy in us. In a gesture of grand declaration, the first things we let go of were our huge mattresses and box-springs. Oops! I will share more about our decluttering in a later post. It did take us a while to decide on a new bed and mattress which would spark joy in us every time we walk by or use them. 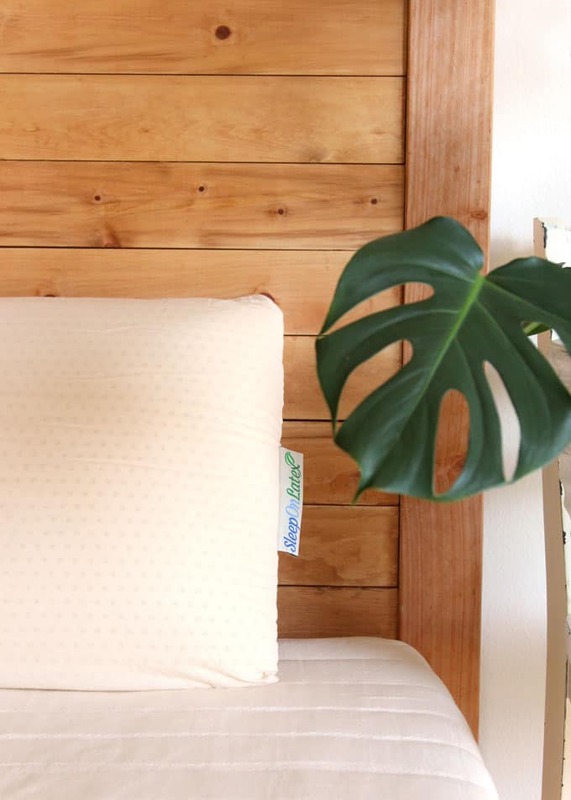 When I shared my idea with our dream mattress company Sleep On Latex, they generously sent us some amazing gifts to support our DIY project : a heavenly mattress made of 100% natural latex foam, certified organic cotton and organic New Zealand Wool! Plus two luscious latex pillows! The lovely mattress and pillows sat in the box for another 2 months while I fine-tuned the designs, and mustered up the courage to go for it with dear hubby’s help! Hubby is always super supportive. This time, he is not only supportive, but beyond excited about how surprisingly easy it was to build this bed and how much he, a born perfectionist, loves our new, sturdy, gorgeous bed! Please follow good practices to build safely and smartly. Follow safety guidelines for each tool. Work on a clean level surface, free of clutter or debris. Always use straight boards. Always wear safety goggles and hearing protection. And remember to check for square after each step! Do NOT use pressure treated lumber, there can be toxic chemicals in them! 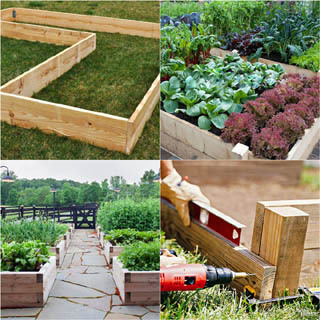 To build a wood bed frame that is beautiful and sturdy, we need to choose wood for strength, work-ability and beauty. Select wood with structural integrity, tight grain, small knots , few cup and twist, and no splits. Knots are very dense, making them hard to drill and cut through. Study the plan to see where the screws are, and select boards with few knots in those areas. We used Douglas Fir for our bed posts and rails. It is a popular structural/construction lumber on the west coast. The wood is very stiff and strong. 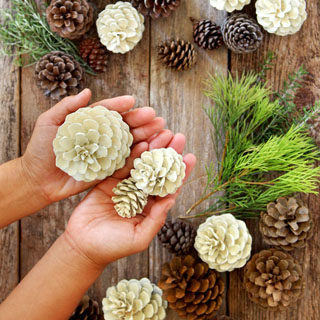 Southern Yellow Pine / Spruce Fir is also a great choice and popular on the east coast. Other great choices are Poplar, Ash, Oak, Alder, Birch, Cherry, and Maple. 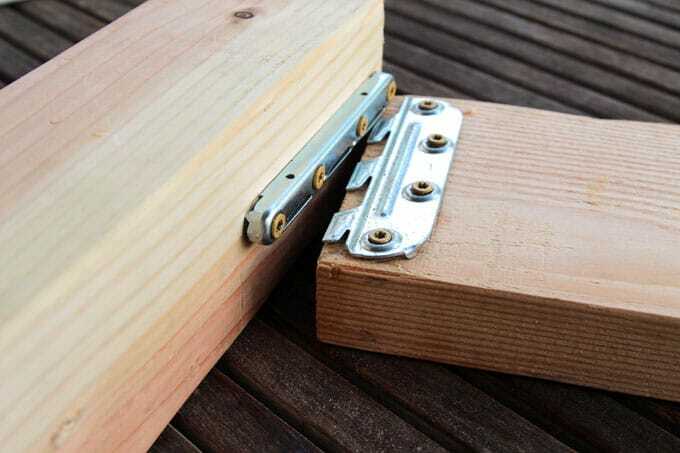 If you are using other species of lumber, make sure that the wood is good for structural use. Don’t just base on the name ‘hardwood’ or ‘softwood’. 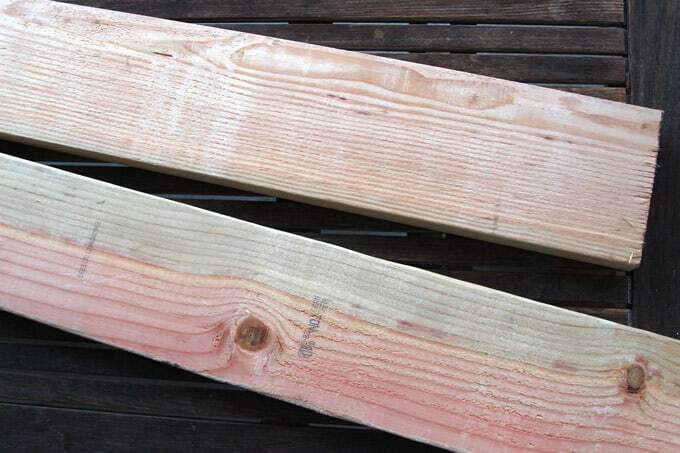 An example about hardwood vs softwood: Doug Fir is a softwood that is super strong, while Basswood, a hardwood, is super soft and has poor screw holding characteristics. Which means a rocky and squeaky bed frame! Plywood slats and spacers: (14) 3″ wide x 5′ long. We used PureBond 1/2″ thick plywood which is a great quality, formaldehyde-free plywood. The sheet is 4’x8′. 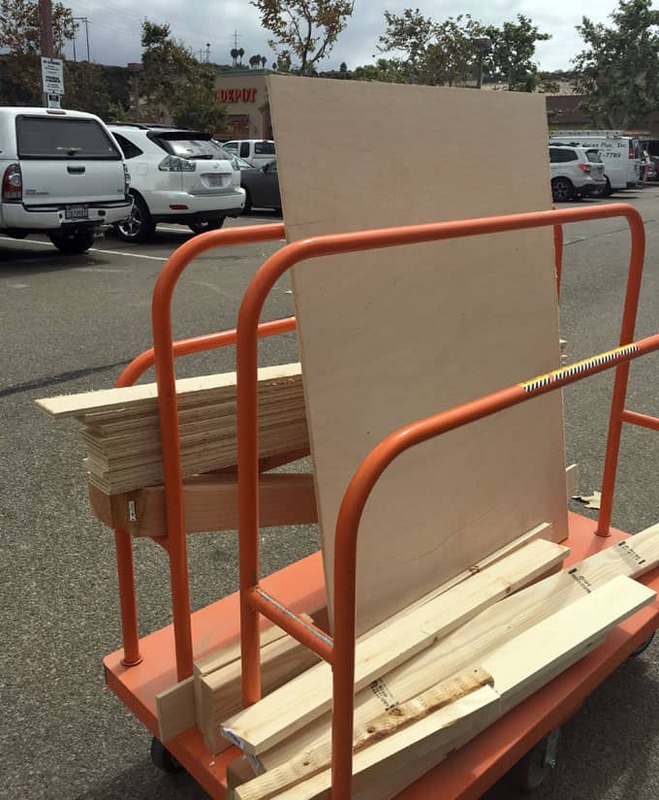 Home Depot cut it to 4’x5′ first, then to 3″x5′ slats for us. We cut one of them into smaller spacers later. Bed rail brackets : Our DIY bed frame can be easily assembled or disassembled when moving thanks to these awesome bed rail brackets! They don’t come with instructions, so I have included detailed instructions on how to install these brackets. 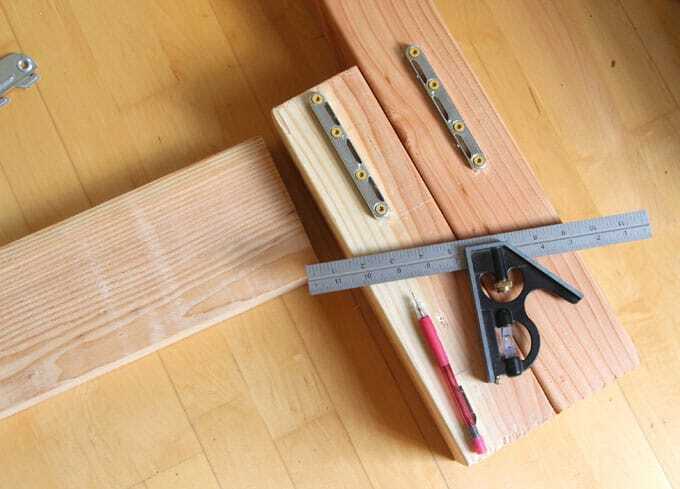 IMPORTANT: after all the wood is cut, check the pieces together which have the same length: this will ensure our DIY bed frame is square and all the pieces fit nicely. Consistency is more important than numbers! 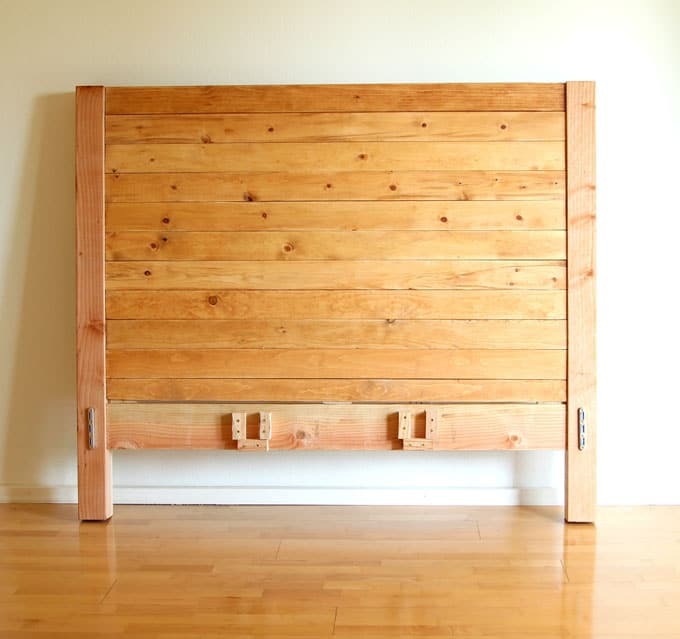 For example: all the 1x4s on the headboard should be the same length as the two 2x6s on the headboard and foot-board. 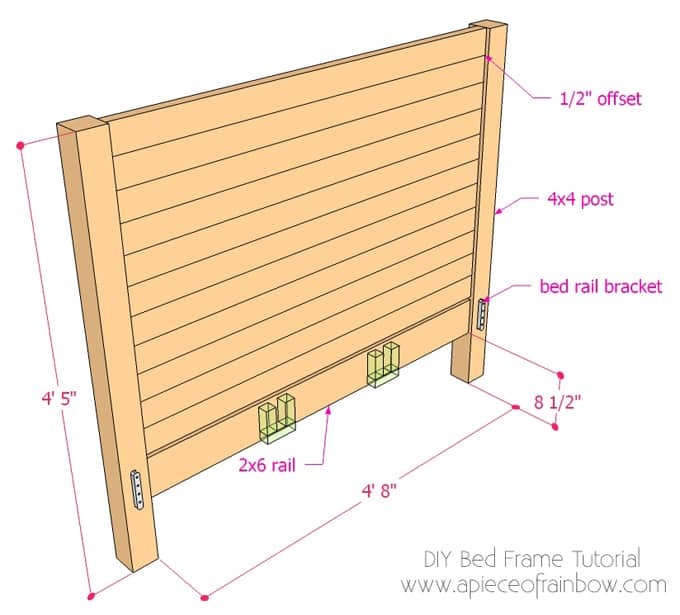 It is OK if all of them are, let’s say, 1/4″ less than what is written on the plan (this diy platform bed frame is forgiving if you are off by 1/2″ to 1″ ). It is NOT OK if some of them are 1/8″ more, and some are 1/8″ less than the 4’8″ on the plan. Sand all the cut surfaces and exposed surfaces so the wood is nice and smooth. If you want to paint or stain the wood, now is a good time. This important step is not difficult, but it requires patience and accuracy. 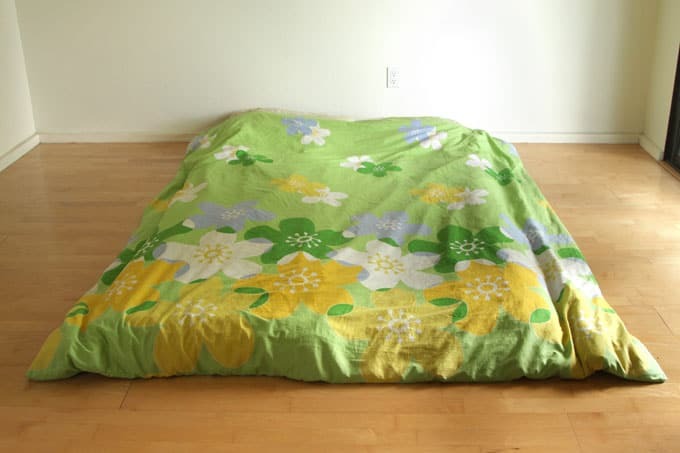 If you do it right, the rest of the DIY bed frame is super easy! Let’s see how to install bed rail brackets in detail. These surface mount bed rail brackets come in 4 pairs. The brackets with the slots goes on the 4 bed posts, and the brackets with the “claws” goes on two 2×6 6’6″ long side rails, one on each end. 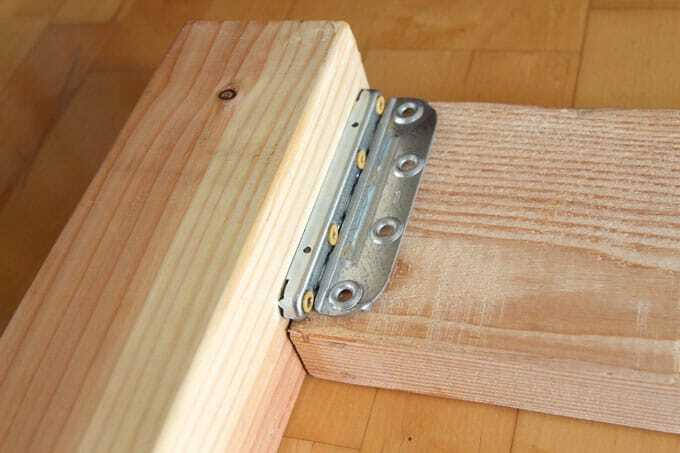 Set a 2×6 rail ( or use a smaller scrap piece of 2×6 ) on a foot-board post, the top of the rail should be flush with the top of the post. The end faces of the rail and post are touching when mounted. 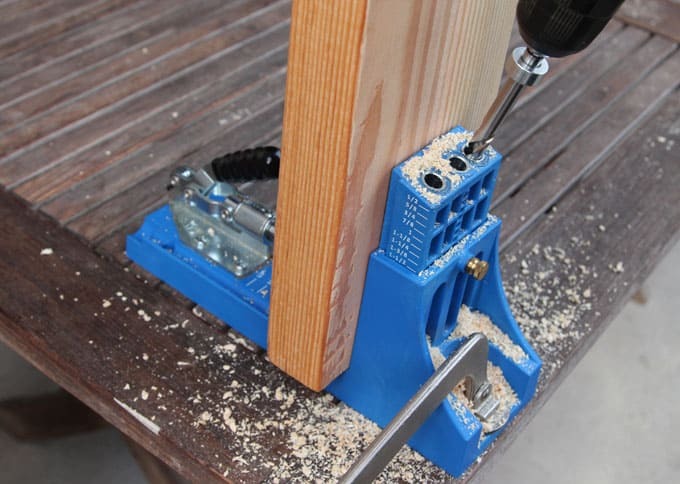 Set the pair of brackets in a locked position onto the post and rail, and mark the outer edges of the brackets and each drill hole carefully. 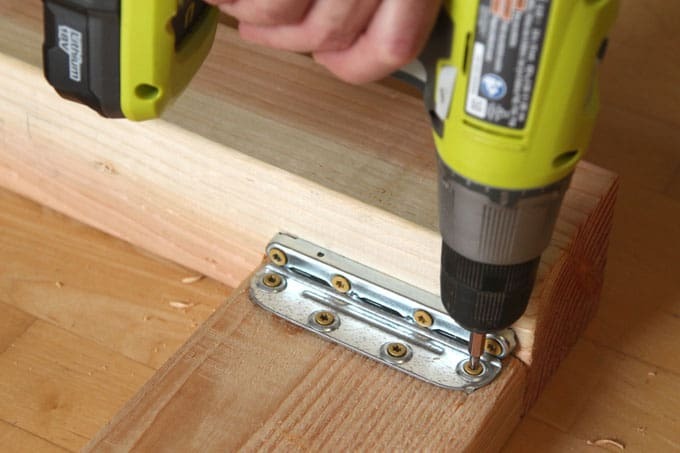 First, pre-drill each marked drill hole, and attach the slot bracket onto the 4×4 post using 2″ to 3″ long screws. If you are off, the rail will not be flush to the post. Remember to keep checking at each step! This happened to us once. We filled the drill holes with JB Weld wood putty and redid it. Have some JB Weld wood putty handy, you might need it to correct mistakes! Next, attach the “claw” bracket to one end of the rail, check everything is square and flush. Don’t tighten the screws too much on the “claw” brackets yet. At this stage, we want to easily hook and unhook these brackets. In the final step when we get the brackets hooked together, we will tighten the screws so the bed is rock solid! Repeat this process until you installed all the brackets. Keep checking to make sure everything is lined up accurately in all dimensions: height, width, and depth. 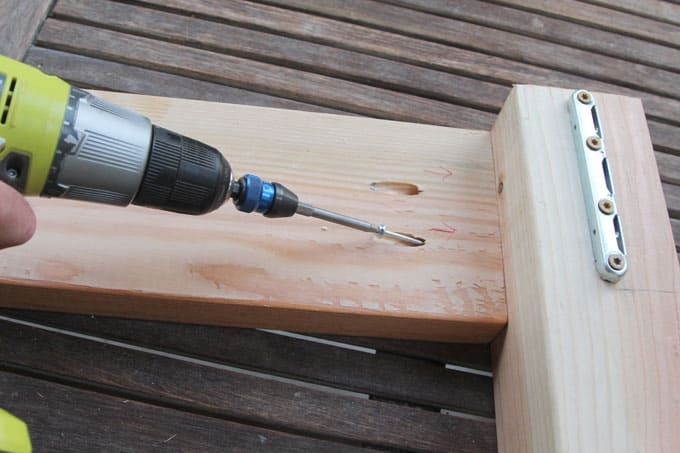 Tip: It is easier to drill all the pocket holes first, then screw the pieces together. Instead of making this super long tutorial even longer, I have included detailed step-by-step instructions on how to build the center panel, how to check for square, wood movements, plus other helpful tips in this DIY wood headboard tutorial here. It also includes variations on how to build a wood headboard like this if you already have a bed frame and just want to add a headboard! 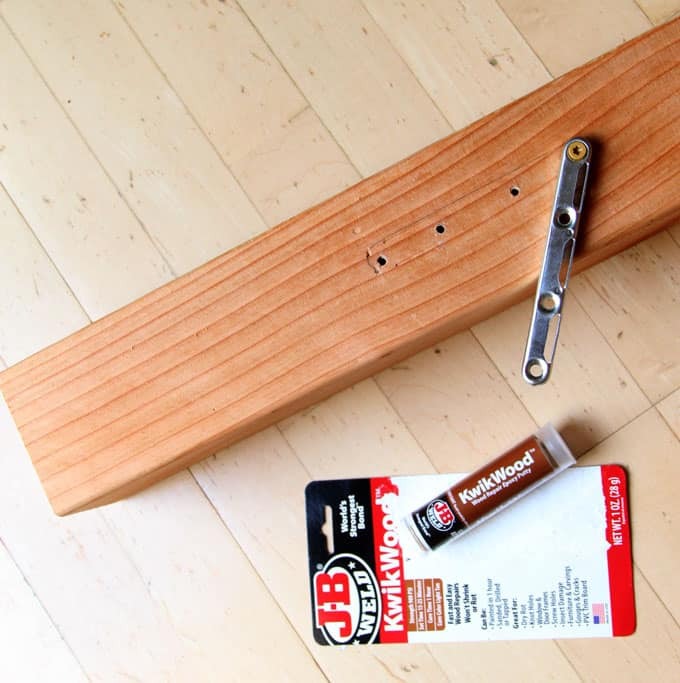 For our DIY headboard, I gave the boards a light gold stain to bring the white pine 1x4s closer in color to the Doug Fir posts and rails, using Recipe #7 in this tutorial: Easy Homemade All Natural Wood Stains with 7 Recipes! 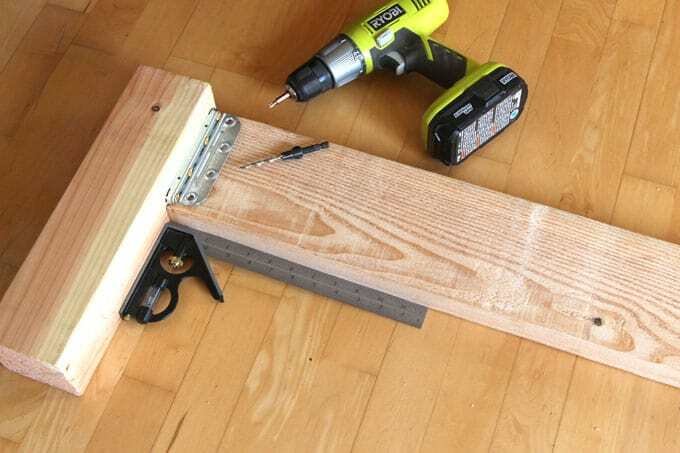 To build the footboard, use 2.5″ pocket hole screws to attach the 2×6 to the 4×4 posts, ckeck they are flush at top and on the side that faces out. The new bed looks wonderful!! Great job with the DIY! This is super nice! I’m not quite crafty enough to make a bed frame with headboard like this but it turned out awesome! This is awesome! It looks like an expensive store-bought bed, and only $100, also love the super detailed drawings! Good job! 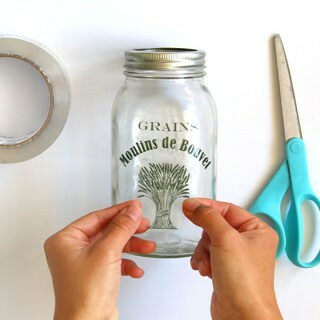 Awesome DIY! Looks so beautiful! It must feel amazing and the mattress looks incredible!! Amazing work! I’m always impressed with myself when I can even put my IKEA furniture together. It must be so gratifying to sleep comfortably on something you built yourself. Super inspiring!! Absolutely nice article!! the bed with the mattress and headboard looks amazing! Very inspiring!! very nice job! i love how it looks. it goes so well in the room, and looks super comfortable. i’m so impressed! Wow, what an undertaking – I’ve never thought of designing my own bed but I guess it makes sense to have something perfect and personal when you spend a third of your life in it! The final result looks stunning – enjoy sleeping on the gorgeous mattress!! Wow, I’m so impressed with people who DIY and it looks so incredible! You guys did an amazing job! I will have to think about this as I am considering getting my daughter a new bed in the near future. I am not sure that this is the right size for her room, but this looks great, maybe I can make some modifications. 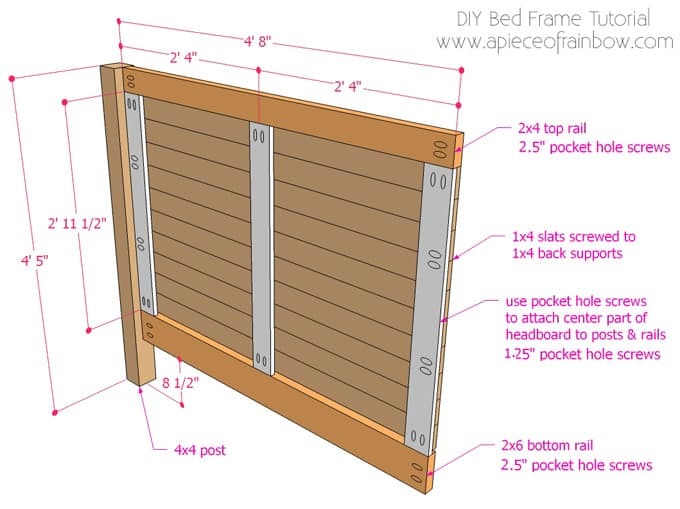 I love, love, LOVE DIY projects… I would love to give this headboard a try, it’s simple and beautiful! I love the wood texturized white wash wall decor as well that I will some day DIY for my house too! THANK YOU! Okay, now I’m done with my story… :)! Great tutorial, looks so beautiful!! 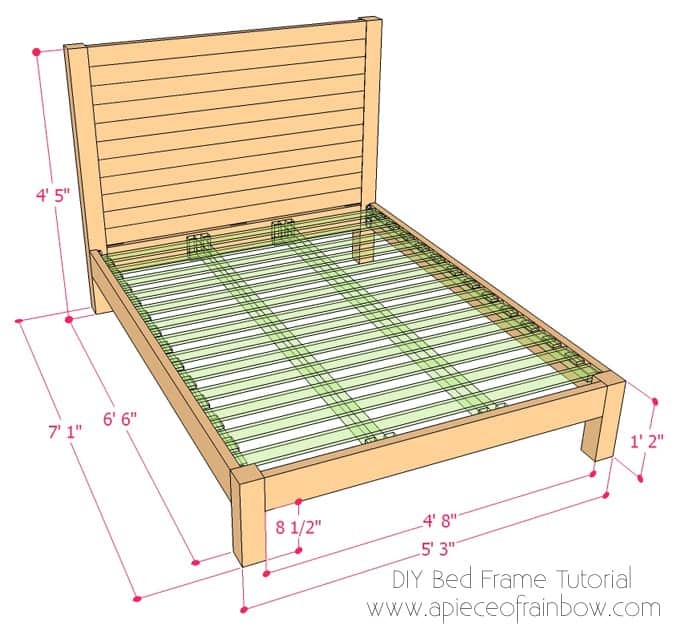 We would love to build this for our next bed! Firstly, I can’t imagine how a half empty air mattress could possibly spark joy! LOL So then did that mean that there was a lack of joy during the time you slept on the floor? I went without during a good part of my life, so not only does everything I have chosen to have in my house or just the freedom of choice in my life, bring me a spark of joy…but I appreciate and a am grateful for all inanimate AND animate things in my life. BUT that being said, I absolutely love your bed and your craftsmanship! Kudos and enjoy!! I love your bed! Thank you for the detailed plans and especially how you installed the brackets. I had trouble with those and switched to these brackets from Rockler – rockler.com/surface-mount-bed-rail-brackets. 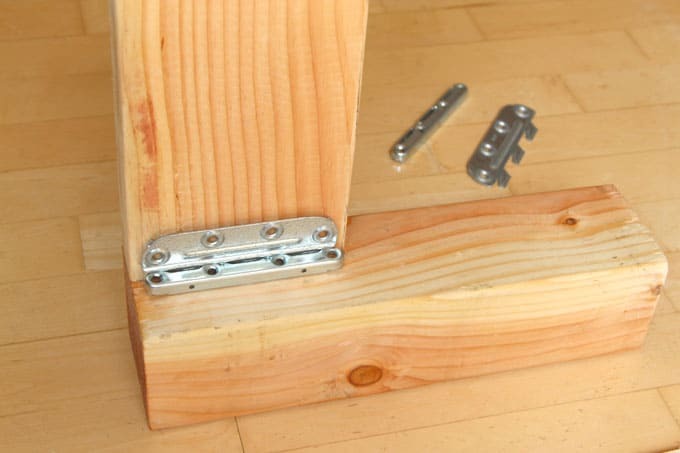 But will give the ones you used a second try since I still have a set and plan to build a king size bed, My problem with the brackets was with the claw side. Once screwed on they were difficult to insert. I will try loosening the screws and then tightening them after like you suggest doing. Thank you for sharing your awesome talent and creativity. Was this the case for the lumber you used to build your bed? I’m not sure if this is standard. Thanks for your help and your beautiful oh so inspiring website. hi laura, yes that applies to most wood we get, including what we used here, and on the plans! =) so you are good to go! Awesome build, correct measurement is a must for the final project to be like the drafted design. Really love the simplicity of the design. The stringers should be 6 ft 10 inches instead of the listed 6 ft 8 inches. Instead of 2 inches longer than the side rail, the stringers need to be 4 inches longer because you gain 2 inches in length on each side from the posts. just to clarify, are the plans for a queen size bed? Is there any concern that the design wouldn’t be strong enough for a king bed? Specifically, would the frame need more center support, such as extra stringers and/or legs? Mary i just finished mine and it is a king size made out of cedar. 1. If using Douglas for the highest grit sand paper you want to use is 100/120…otherwise it doesn’t absorb stain as well. 2. We highly recommend using pre stain. It’s a super easy step that doesn’t take long and it helps the wood to evenly absorb the stain as opposed to having it’s softer and harder spots absorb the wood lighter and darker. 3. For the headboard you actually need TEN 1×4’s. The instructions say 9 but the diagrams show 10. It was very frustrating to get everything ready to assemble the headboard only to discover we had to run to the store and buy another and cut, sand, pre stain, stain and clear coat one random board. 4. Depending on how you assemble the bed, the strivers could use an extra inch or two in length. They still work a little shorter but maybe cut them a little longer and sand or cut it down later. 5. Also, instead of using wood, we bought 2×4 joists to attach the stringers. They’re about $0.75 each and was just easier for us. The project took us about a week in all. We were only really working in the evenings and juggling two small children and extremely hot temperatures. I’m pregnant and still found this to be an enjoyable project to do together with my husband. Everyone is so impressed with our bed and we think it’s pretty great ourselves!!! I wish I could post pictures! Hi Eliese! I just finished making this in king size (using poplar), and used the metal joist brackets too! Indeed, they were only $.78 at Lowe’s. My support slats and spacers were actually .75” boards, instead of .5” plywood, so this allowed me to hang the stringers a tiny bit lower to accommodate the extra height. I ran into your issue with the headboard, too… I was one board shirt, but could only fit a 1×3 at the bottom, instead of a 1×4. It looks like Ananda used a smaller piece here too. Ananda, thank you for sharing your plans! This was a blast to make! How can those who have followed your tutorial share photos of the final product? hi chelsea, thank you so much for sharing!! 🙂 you can tag apieceofrainbow on instagram or upload photos on our facebook page, and i will share them in the post! Would you be able to share the materials with wiemeasurements for the king size bed? I would love to start this project up this week. How is your bed holding up? This looks like a simple and beautiful frame. Amazing work! Thank you so much for sharing!! If I wanted to modify this so that the mattress didn’t sit atop the entire thing, but rather fit into the frame (with a few inches of wood surrounding the lower half of the mattress) would that be possible? 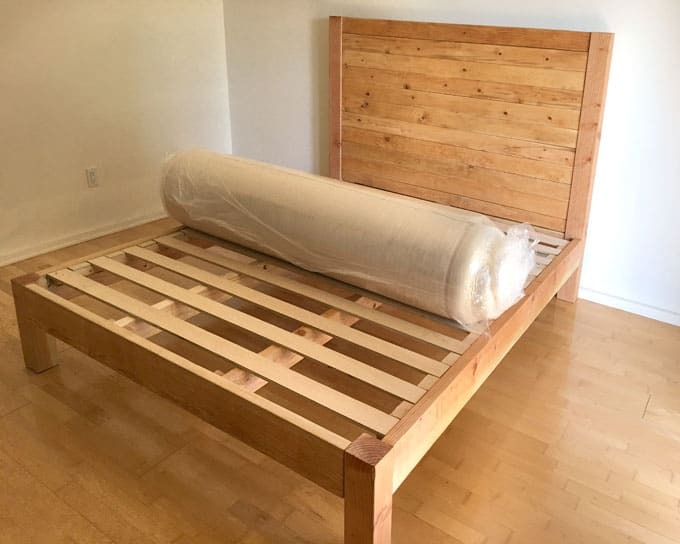 I imagined adding an additional board to make the sides taller, or dropping the slats down so the mattress was inside the parameters of the wood would work…though I really don’t have much experience with woodworking and realized the measurements may be a bit too small to fit a queen size mattress into the frame as opposed to having it floating. What are your thoughts on this? I hope the way I’ve explained it makes sense! hi hanna, yes you can drop the slats lower, and / or use 2×8 instead of 2×6 . the current plan measurements of the 4 sides will allow the mattress to fit inside. but double check your mattress, especially if it has hard rigid sides! Hi ananda! Was wondering, for making this accommodate a full size bed, would I just reduce all measurements by 6 inches? According to the chart at the end of the article a full size bed is 6 inches shorter on both sides than a queen. 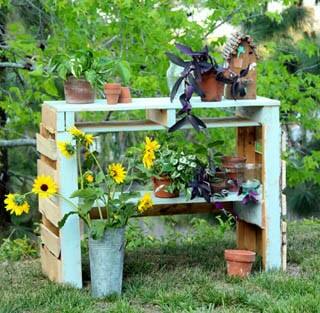 That is fantastic way to utilize the pallets! My husband got a lot of them at our recent project. Will definitely use it and try it out. so dumb question. when screwing the 1×4’s to the 1×4 supports. did you screw from the back going forward or through the front? also is glue on the 1×4’s a bad idea? Wow, this is beautiful. Such a great tutorial too with all the info anyone could need! Thanks so much, hoping to make our frame within the coming weeks!!! 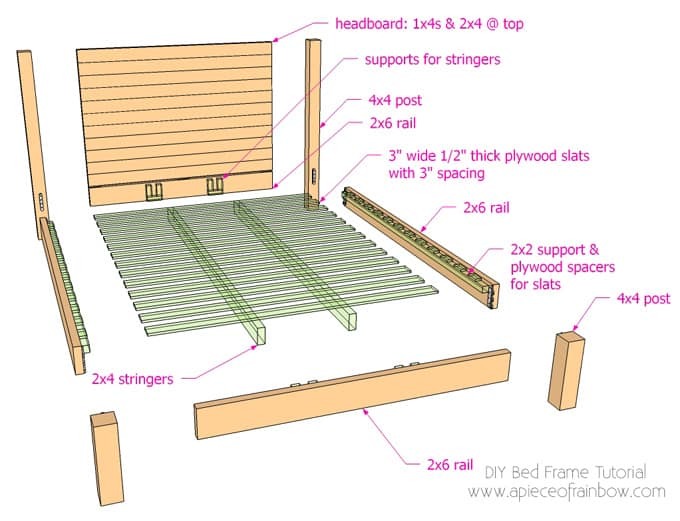 Love the project quick question though how did you get the 10 slatst slats for the headboard I have 3 1x4x10′ and 3 1x4x8′ and am only coming up with 9 slats after you take out the 3 2’11” pieces for the back. Hi! What color stain did you use? I noticed you posted a link to the diy stains and you said you used recipe #7, but I am a little bit confused because when I went to the page, recipe #7 was a recipe for staining wood colors like blue? 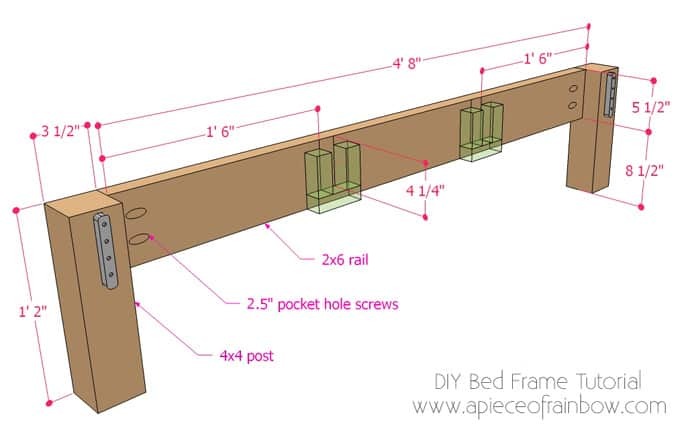 Hi Ananda, what are you using to connect the short side of the bed frame to the posts? Are you gluing the 60″ 2×6 to the posts? Just finished mine! Such a fun way to spend time, I absolutely loved the finish product. Thanks for putting this together, I would have never thought this was something I could do and have it actually turn out well! I cannot figure out how to get the graphics that you used on the box with the oranges. I signed up for your emails, but I feel like I’m just going in a circle looking for the graphics. Thanks for your help. Wow! As coolly at you it turned out. Bed simply super! Such beds in shops stand from $1000, but I even couldn’t think that it can be made most and for only $100. I just moved to the new apartment and itself should choose quickly furniture so far there do repair and repair system of heating, after all in Philadelphia is cool now. Whether now I will think it is worth buying in shop or it is better to make most. Thanks for the instruction, I will watch further your new ideas.